How often do you listen to other writers speak? I don’t mean reading what they’ve written, but listening to them talk out loud—hearing the words drip from their lips. When authors share prepared remarks or better, speak off the cuff, you get a whole different insight into their writing—and your own. I was hunting interesting websites to share with my Creative Power Writing Facebook friends last night, and as things happen, one idea snowballed into another. Weird Al Yankovic’s Word Crimes video popped up and I bookmarked it as a future post; then I thought, Hey, maybe I should look for more videos! Living or working in a university community provides an invaluable opportunity for writers to listen to other writers. (I hate that word, “invaluable”—it always sounds like it means “not valuable.”) Again at Rowan, I attended a talk by Neil Gaiman, author of The Ocean at the End of the Lane and American Gods. He shared a clever storytelling method that I later used with my creative writing students. He told a story Jeopardy-style, entirely through answers. Not until the very end did he reveal the questions. Gaiman also dismissed the concept of “writer’s block,” reminding us that grocers don’t get grocer’s block or house painters painter’s block. Each of us, he suggested, has within us multiple tools to enable us to break through when we feel stuck. If you are fortunate enough to live in a community where authors speak, go listen! If not, take advantage of the many wonderful videos on YouTube. You’ll need to be selective, as you can’t simply type in “writers” and immediately find something that will blast your booties off. Here are some guidelines to help you find something meaningful. 1. First, choose a favorite author. Are you interested in a specific book? 3. What format would you like the talk to be in? 4. Look for a video with the focus you seek. Later, branch out to other authors who will help you develop your craft. Whom do you listen to? Share below! 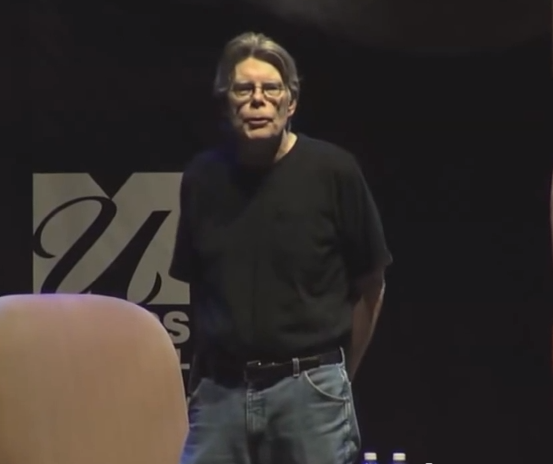 Stephen King Answers Questions—AWESOME! This is the video I mentioned above, with King at UMass Lowell.